The Roman tenth Legion - LEGIO X FRETENSIS - was the legion stationed in Judaea during the time that Jesus Christ lived on Earth. Any history of LEGIO X FRETENSIS is incomplete without mention of Christ and what impact his life may have made on the Roman soldiers stationed in Judaea. In addition, the Roman military presence in Judaea had a great impact on Christ's ministry as well as the religious and civil politics of Judaea and its major city of Jerusalem. It is generally thought by scholars that the fear of reprisals by the Roman military against the established power of both the priests and the civil government was a major cause of the desire of the "Chief Priests and Pharisees" to do away with Jesus. Jesus was called the "King of the Jews", and, in some people's eyes, he was a threat to Roman sovereignty in the region. Jesus made it quite clear that his kingdom was "Not of this world" and the mere fact that He wore the clothes of a poor man and lived the life of the poorest of his countrymen gave credence to his statement that his kingdom was a spiritual rather than a temporal kingdom. Pontius Pilate, the Roman prefect before whom Jesus was tried understood this fact and found no threat of sedition from Jesus. However, there had for many years been a seething undercurrent of rebellion in some of the more radical segments of the Jewish society and this tended to cause many to mistrust Jesus' message of peace, love, and salvation. But He perceived their craftiness and said unto them, "Why do you tempt me? Show me a denarius. Whose image and inscription does it have? " They answered and said, "Caesar's." And He said unto them, "Render unto Caesar the things that are Caesar's, and to God the things that are God's." There is more than one reference in the Bible to interactions between Jesus and the soldiers of the Tenth Legion. It was the common Roman soldiers that crowned jesus with thorns and mocked him as the King of the Jews, and these same soldiers later carried out the execution of Jesus. After His death, they divided up His clothing. One incident clearly shows the authority a Roman officer had over the troops under him, and how this officer recognized Jesus as a man with authority. "Wherefore neither thought I myself worthy to come unto thee: but say in a word, and my servant shall be healed. You are encouraged to create your own personal experiences in witnessing the words spoken and the physical actions displayed by Jesus, as reported in the Bible. Together, we will present these "mosaics" of individual experiences to the public in our drama, "Who is this Man?" You will be given the opportunity to offer a personal testimony of your own experiences on how Jesus impacted upon your life. Our time period will be the year 784 AUC (31 AD), just over a year's time from the crucifixion of Jesus. The following hypothetical dialogue between Hibernius and Centurio Marcus, the Roman names of Peter Corliss and Robert Garbisch, both members of the modern reenactment group LEGIO X FRETENSIS. Yes, you are correct! This new Judean mystery cult is very strange. Yet, at the same time, it is not much different than some of the teachings we have known elsewhere with our empire. I am studying the writings of this strange man, Saul of Tarsus, or as he fashions himself now, Paulus. This man grew up in the city of the center of Mithras' religion- Tarsus, along the Cilician coast. He was certainly aware of the Greek philosophical schools, was for a time trained as a Jewish Pharisee, and now he turns his back on all these teachings to learn more about this new "Way" you speak of. I have even heard he has bristled the other followers of this cult, who follow the teachings of this Jesus of Nazareth. Specifically, their leader, Petrus, was chided by Paulus for trying to make accommodations with the Jews. Paulus did not believe accommodation with the Jews could ever happen. Knowing how rebellious they can be, I tend to agree with him. And yet, of course, they are also often quite productive and educated members of our Empire. We shall never know whether Petrus would have succeeded in reaching accommodation, because after his chastisement by Paulus'words, he seems to have mainly stopped in that course of action. The traditional Judeans, for their part, have not forgiven Paulus whatsoever, but wanted to put him to death. Paulus used his status as a Roman citizen to get his case escalated to the Emperor. He is being held right now, and I have not discovered whether his case has been presented in Rome yet. Paulus' adoption of this cult and interpretation of who this Jesus really was seem to have taken quite a turn from what the other followers had known through personal experience. Indeed, it is rumored this Paulus never even meet with the teacher during his life. Yet, he seems to believe he knows this man better than those who spent years with him. Again, his apparent audacity is great. What a seeming hypocrite! He participates in the murder of another of the followers of this new cult, then adopts the belief himself, amd then starts to monkey with it as if it were his own. And yet some claim he is humble in person, or at least plainspoken. I shall try to secure copies of his lectures and analyze them. I shall surely perform further investigation of Paulus, yet shall reserve it for a future dispatch. My current line of investigation is to try to tie Paulus, or Saul, in his early life to the widespread belief of Mithras throughout the Cilician region. It is my contention that Paulus' early life in this city would have had some minor if not major effect on his actions and beliefs. The Cilician coast has always been known to produce some rather wild progeny. The Republic was greatly fortuitous when we broke their backs and those of their ally, King of Bythnia and Pontus, Mithridates ("Blessed of Mithras"). There seems to be a long-held belief in this land, going back to this mystery cult. I will attempt to see if I can make contact with the Cilicians, and perhaps join their Mithraic cult myself. Apparently, the first grade is the "Corvus" (Crow). If I can learn more about the Mithraic mystery cult, perhaps I can gain some understanding of why Paulus' interpretations of this Judean cult are so rapidly being assimilated by the people of Greece and Anatolia. May the Fortunes smile down upon Rome. Excellent report. This is just what the Emperor Tiberius wants on that troublesome individual who now calls himself Paulus. If he wasn't a Roman citizen, I would have him executed right now. As it stands, his case shall be heard in Rome. As you already know, the Emperor prefers to stay in seclusion on the Isle of Capri. Sejanus appears to be running the Emperor's show right now. But rumors are circulating that his days of power control are numbered. 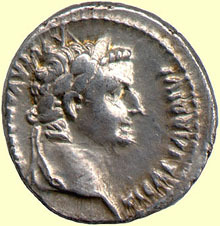 The arrest of Agrippina, widow of Germanicus, and her eldest son Nero, was a bad move on Sejanus' part. Don't you agree? What is your opinion about the distasteful act of Tiberius in doubling the hated Sales Tax imposed by Augustus. I mean, after all, a 1% tax cuts into my personal profits. It was generous of Tiberius to cut it in half during his third year of rule. But to restore it again to the 1% level this year (784 AUC) is expecting too much. Especially since he doesn't appear to give any of it back to the people in lavish games or other forms of entertainment. May the Gods continue to bless the Empire in all its glory. The following two dispatches were exchanged between Peter Corless and myself. This is the type of Living History dialogue we need to develop in our drama presentations to the public. Peter has appointed himself to be the skeptical investigator of this new religious cult called "The Way". ROMANS 8:28 And we know that all things work together for good to those who love God, to those who are called according to His purpose. ROMANS 8:35,37-39 Who shall separate us from the love of Christ? Shall tribulation, or distress, or persecution, or famine, or nakedness, or peril, or sword? Yet in all these things we are more than conquerors through Him who loved us. For I am persuaded that neither death nor life, nor angels nor principalities, nor powers, nor things present nor things to come, nor height nor depth, nor any other created thing, shall be able to separate us from the love of God which is in Christ Jesus our Lord. It is here, in this historical time setting, that we shall draw upon our own chosen destiny of personal involvement with the man, Jesus of Nazareth, the son of a Jewish carpenter. It was recorded in the Roman census that he was born in Bethlehem, a small caravansary village located along a major trade route. A minor "camel stop" that mainly catered to road weary merchants, pilgrims, and other travelers. Bethlehem is situated on a low but steep ridge in the rocky hills just south of Jerusalem. This village is surrounded by green fields and lush olive groves, but close to the east is a harsh wilderness, beyond which lies the Dead Sea.